I recently saw this tea-set in a junk shop near me in Spain and despite knowing nothing about porcelain I was attracted to it and had to buy it. It comprises teapot, milk jug, sugar bowl and four cups and saucers. Unfortunately, between seeing it and buying it they managed to break the top to the milk jug at the shop! I was interested to see your web-site and wondered if you could tell me anything more about what I have bought or where I can do some research. Thank you for sending this interesting question. I can understand your fashination for this dramatic design. Thanks to the mark as well as the design which typically contained young ladies in a garden setting, this type of wares are generally refered to as "geisha girl" porcelain. The mark on the bottom as such is called a "Lithophanes". 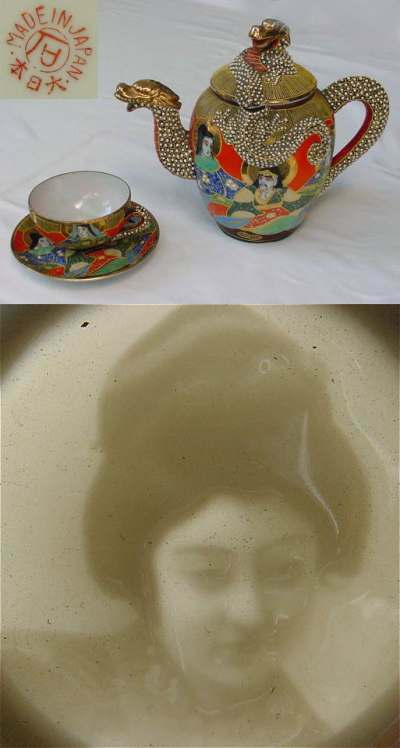 These Lithophanes occurs almost exclusively on the bottoms of tea cups. The porcelain itself is Japanese and were made at the Kutani factory probably from the late 1930s - when tea bags was invented - into the 1960s. Before the late 1930s there would have not been much use of a picture in the bottom of a cup since it would have been hidden by the loose tea leafs. This marking span from the late 1930s and into the late 1950s/early 1960s. Many thus dates to the "Occupied Japan" period and could have been made for the GI trade why the US Customs "country of origin" rules would not apply. As a note of interest I believe that your Lithophanes is of the highest quality, with highlights such as lighting effects and subtle strands of hair and with a real contrast between light and dark areas.